The vast majority of America’s electricity is generated from fossil fuels. These generators are the #1 producers of harmful CO2 emissions. Better World Energy believes that the best way to reduce CO2 emissions is to replace traditional energy regeneration with electricity from clean renewable energy generators. The renewable energy industry has developed protocols for determining the amount of carbon dioxide that is offset when renewable energy is place on the grid in various areas of the county. Presently, Better World Energy is procuring wind energy renewable energy credits in the Northeast. In the Northeast Power Coordinating Council region of the United States, 1,341 lbs. of CO2 are offset by 1,000 kilowatt hours of electricity from a wind generator. This rate is used by Better World Energy to determine the quantity of renewable energy credits corresponding with all CO2 emission offsets. By purchasing renewable energy credits, you support adding clean renewable energy to the electricity pool and reducing global reliance on fossil fuels. The offset for a house corresponds with national averages for home electricity and fuel use in which the average Single Family Detached Home consumes 13,148 kWh of electricity, 4,7101 CF of natural gas, and other amounts of fuel oil, kerosene, and LPG that results in emissions of a total of 25,242 pounds of CO2, which requires 18,823 kWh of renewable energy to be placed on the grid to create this offset. This figure is simplified to 19,000 kWh in order to facilitate transparent tracking of renewable energy certificates. The offset for an apartment corresponds with national averages for home electricity and fuel use in which the average apartment uses 7,005 kWh of electricity, 23,233 CF of natural gas, and other amounts of fuel oil and LPG that results in emissions of a total of 13,136 pounds of CO2, which requires 9.795 kWh of renewable energy to be placed on the grid to create this offset. This figure is simplified to 10,000 kWh in order to facilitate transparent tracking of renewable energy certificates. The offset for a McMansion corresponds with national averages for home electricity and fuel use for homes over 4,000 square feet in which the average home over 4,000 square feet uses 16,766 kWh of electricity, 60,751 CF of natural gas, and other amounts of fuel oil and LPG that results in emissions of a total of 31,489 pounds of CO2, which requires 23.481 kWh of renewable energy to be placed on the grid to create this offest. This figure is simplified to 24,000 kWh in order to facilitate transparent tracking of renewable energy certificates. Calculations for carbon offset solutions for the vehicles follow the methodology used by the U.S. EPA based on fuel data from the Research and Innovative Technology Administration Bureau of Transportation Statistics, mileage date from the Federal Highway Administration, and fuel economy from the Department of Energy. According to these sources, the average vehicle drives 11,720 miles annually. The average vehicle in America has a fuel economy of 22.6 miles per gallon. A fuel-efficient hybrid was projected to have a fuel economy of 50 miles per gallon, and vehicles that are far from fuel-efficient were projected to have a fuel economy of 15 miles per gallon. The amount of CO2 emissions per gallon of gasoline consumed is 8.92 X 10-3 metric tons CO2 per gallon of gasoline. An average vehicle with a fuel economy of 22.6 miles per gallon is responsible for 8,395.22 pounds of CO2 emissions, which requires 6,260 kWh of renewable energy to be placed on the grid. This figure is simplified to 6,000 kWh in order to facilitate transparent tracking of renewable energy certificates. A fuel-efficient vehicle with a fuel economy of 50 miles per gallon is responsible for 3,794.64 pounds of CO2 emissions which requires 2.829 kWh of renewable energy to be placed on the grid. This figure is simplified to 3,000 kWh in order to facilitate transparent tracking of renewable energy certificates. A “gas-guzzler” vehicle with a fuel economy of 15 miles per gallon is responsible for 12,648.79 pounds of CO2 emissions, which requires 9.432 kWh of renewable energy to be placed on the grid. This figure is simplified to 9,000 kWh in order to facilitate transparent tracking of renewable energy certificates. Calculations for carbon offset solutions for air travel are based on emissions data from the Green House Gas Protocol Initiative. A short flight is assumed to be 500 miles one way. A medium flight is assumed to be 2,000 miles one way, and a long flight is assumed to be 4,250 miles one way. Because a higher amount of fuel is used during takeoff than in flight, and because longer flights carry more passengers who all share the carbon burden, three different emission rates of CO2 equivalents per mile are used. The offset for a short flight was based on 0.67393 lbs of CO2 equivalent per mile. The offset for a medium flight was based on 0.3547 lbs of CO2 equivalent per mile. The offset for a long flight was based on 0.31923 lbs of CO2 equivalent per mile. A short roundtrip flight of 500 miles in one direction is responsible for 673.93 pounds of CO2 emissions, which requires 0.50255 kWh of renewable energy to be placed on the gird. This figure is multiplied by two and simplified to 1,000 kWh in order to facilitate transparent tracking of renewable energy certificates. The short flight offset accounts for two short roundtrip flights (four one-way flights). A medium roundtrip flight of 2,000 miles in one direction is responsible for 1418.8 pounds of CO2 emissions, which requires 1.058 kWh of renewable energy to be placed on the grid. This figure is simplified to 1,000 kWh in order to facilitate transparent tracking of renewable energy certificates. A long roundtrip flight of 4,250 miles in one direction is responsible for 2713.45 pounds of CO2 emissions, which requires 2,023 kWh of renewable energy to be placed on the grid. This figure is and simplified to 2,000 kWh in order to facilitate transparent tracking of renewable energy certificates. Carbon for wedding offsets are created based on a number of factors including number of guests traveling via car and plane, the distances being traveled by car and plane, and the number of nights guests are staying in hotel rooms. A small offset amount is also considered to correspond with typical wedding day energy use such as lighting and DJ sound systems. Transportation is the largest contributor to CO2 emissions associated with weddings. Theses offset are calculated for each wedding. Carbon offsets for websites are based on the sum of the energy associated with user’s computers while they visit the website. Each computer uses a different amount of electricity. A laptop uses about 50 watts of electricity per hour while a larger desktop and monitor use around 270 watts. 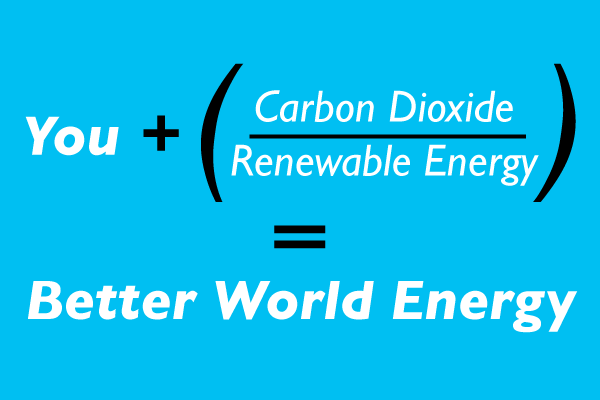 Better World Energy’s calculations are based on an assumed average of 100 watts per hour. Each computer visits a website for a different length of time, but an average time of two minutes and fifteen seconds per visit has been assumed. A blog or small business website with 750 visits per day represents 28 hours and seven minutes of combined computer use time. For the average computer, this requires 2,812.5 watts of electricity per day. In one year, visits to the site generate 1,376.62 lbs of CO2, which requires 1,026.56 kWh of renewable energy to be placed on the grid. This figure is and simplified to 1,000 kWh in order to facilitate transparent tracking of renewable energy certificates. An “internet sensation” website is assumed to have an average of 7,500 visits per day represents 281 hours and 15 minutes of combined computer use time. For the average computer, this requires 28,125 watts of electricity per day. In one year, visits to the site generate 13,766.2 lbs of CO2, which requires 10,026.56 kWh of renewable energy to be placed on the grid. This figure is and simplified to 10,000 kWh in order to facilitate transparent tracking of renewable energy certificates.